The Twilight star Robert Pattinson demonstrates he’s more than a sparkly vampire in the latest David Cronenberg’s film, Cosmopolis (2012), to be screened at Splendid Cinema on the 28th of April. Adapted from the acclaimed novel by Don Dellilo, Cronenberg’s film focuses on a 28-year-old multibillionaire Eric Packer (Robert Pattinson), whose limo journey across a futuristic Manhattan becomes something of a confrontation with everyone who is directly affected by the heartless demeanour of his luxurious lifestyle. Cronenberg combines Dellilo’s dry, comic satire with a stone-dead, but immersive atmosphere shaped by both Pattinson’s performance and clearly measured, smooth cinematography, making Cosmopolis a very charismatic picture, and is not to be missed! Cosmopolis also features an international assemblage of actors including Juliette Binoche, Paul Giamatti, Samantha Morton and Jay Baruchel. In addition, Worcester’s only independent cinema will also be screening Irish: On Purpose, a short film by Olivia James, before Cosmopolis as part of the Splendid Cinema’s initiative supporting local filmmakers. 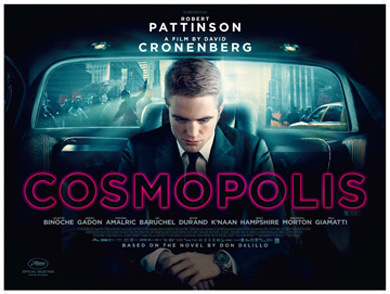 Cosmopolis (Can/France/Italy/Portugal, 2012, David Cronenberg) 105 min. 15 Cert. 27 January: Jo Nesbø’s Headhunters (Morten Tyldum, 2011, Norway) 100 min 15 cert. Adapted from the international best-seller by Jo Nesbø, Headhunters is the nail-biting Nordic Noir about a corporate head-hunter who moonlights as an international art thief and who meets his match in an exceptionally well-trained black ops soldier in a very deadly game of cat-and-mouse. One of the best films of 2012! 10 February: Take this Waltz (Sarah Polley, 2011, Canada) 115 min 15 cert. Canadian writer-director Sarah Polley follows up her 2006 debut film, Away From Her, with this fun romantic comedy starring Seth Rogen and the incomparable Michelle Williams. Filmed entirely in beautiful Toronto, the location footage itself is enough to make you want to cross the Atlantic. 17 February: Mother (Joon-ho Bong, 2009, Korea) 128 min 15 cert. The mother of a developmentally challenged young man accused of murder will stop at nothing to prove her son’s innocence. Although a slightly older film, Bong Joon-ho’s follow up the incredibly successful Korean monster movie, The Host (2006), is one of the greatest films made in the past ten years and more than deserves a Splendid Cinema screening. 3 March: Mugabe and the White African (Lucy Bailey & Andrew Thompson, 2009, UK) 90 min. 12 cert. After a successful screening at the Worcestershire Film Festival, Splendid Cinema is very pleased to screen this very powerful documentary about a white Zimbabwean family’s opposition to Mugabe’s land reform legislation on the grounds of racism and discrimination. The film’s editor, Tim Lovell, will be in attendance to do a Q&A after the film. 17 March: Berberian Sound Studio (Peter Stickland, 2012, UK), 92 min. 15 cert. British horror is alive and well in this thriller about an English sound technician (Toby Jones), working for an Italian film company, who begins losing his grasp on reality. The film is an homage to Italian giallo films of the 1970s. 7 April To Rome with Love (Woody Allen, 2012, US) 112 min. 12 cert. Woody Allen’s latest Euro-Comedy sees several interweaving stories all focusing on the Italian capital. Stars Allen himself, Ellen Page, Jesse Eisenberg, Alec Baldwin and the great Roberto Benigni. Not to be missed! Robert Pattinson stars in the new film by David Cronenberg, and based on the acclaimed novel by Don DeLillo, about a 28 year-old billionaire who is confronted with the lives he has destroyed as he crosses Manhattan in his limo. All films are screened at the Worcester Arts Workshop (21 Sansome Street, Worcester). Box office opens at 7pm on film nights and the films begin at 7:30. Café Bliss is also open for a pre-show treat. For more information on any of our films, please contact Mikel Koven at splendidcinema@live.co.uk, or look for us on Facebook.